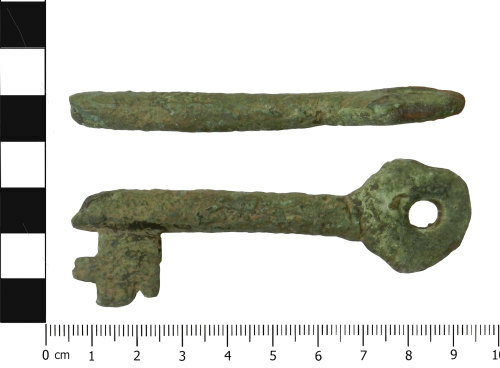 A copper ally key of medieval date. The object consists of a lozenge shaped bow, a stem and a bit. The edges of the bow are rounded and worn probably due to abrasion from within the plough soil. There is some damage to the end of the shank which is hollow. The bit is sub rectangular in plan and cross section. The clefts consist of one small rectangular length of the bit while projecting at a right angle from the side of the bit is another smaller bit with a small rectangular cleft removed. The object has a smooth olive green patina in places however most of the surface is light green and abraded. From the size of the key and the presence of a hollow shank it is likely that the key would have been used to lock a casket or chest rather than a door. Door locks tend to have a solid shank and are larger. The keys illustrated in Egan (1998, 111-119) are all dated from the late 12th - to late 14th centuries (AD 1150 - AD 1400). Therefore a similar date is suggested here for this example. Dimensions: 85mm in length, 25mm in width, 6mm thick, 35.8g. Egan, G. 1998 The Medieval Household Daily Living c.1150-c.1450. Medieval finds from Excavations in London 6. London. Museum of London / The Stationery Office.